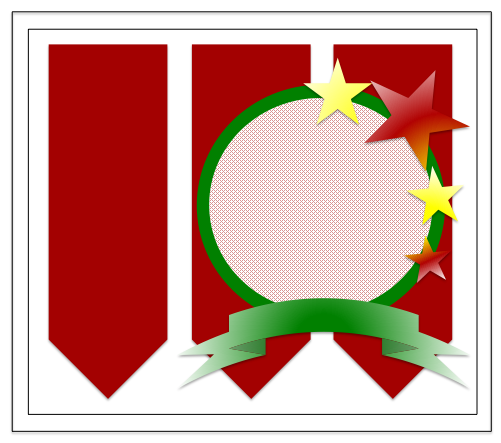 This is my first post as a new DT member of Fun 'n' Flair Stamps. Selina sent the DT this beautiful Christmas set to use. This stamp is so adorable. I had to break out my glitter for this one. After all my coloring, I added glitter to her hat and the bottom of her dress. The glitter is really there, it's not showing up as I had hoped. I embossed the red cardstock with snowflakes from Provo Craft. I added some beads to the pin and added it to the center of the bow. I am using this sketch Selina created. 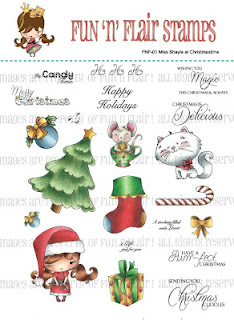 This is the complete stamp set of Miss Shayla at Christmas Time. This is a full 8 1/2" x 11" sheet and Selina is giving away this stamp set so head on over to check out the beautiful projects the DT has made and enter to win this beautiful set. Love all of the lil details! Especially the sparkle & bling. Thanks for joining us at FOSTV. Adorable card. Thanks for playing along with us at Kaboodle Doodles this week. Nice sketch - cute card! Kim your card is adorable, love your take on the sketch challenge...WELL DONE! Lovely card and layout. Thanks for joining us this week at FOSTV. Kim your card is darling! I just love the colors you used on this sketch! Fabulous job! This is a lovely Christmas card, gorgeous traditional colours. What a lovely card, love the stitching and the pin. Fantastic card for your debut, and your pin is lush! Thank you for linking up and playing along with us this week at The Crafty Pad Challenge : ) P.S. I have Santa’s Candy on my blog ! Beautiful sketch! LOVE what you did with it! The Pin and bow are beautiful! Thanks for playing along this week at FOSTV. Wonderfully done card. I never seen someone used the sketch exactaly for their card. Perfect. Love the cute image and stickpin. Thanks for joining us at sentimental sundays challenge this week. Oh what a pretty card! love it! Thanks ever so much for sharing it with all of us at Catch the Bug with Bugaboo Stamps! We hope you'll be back to play along with us again soon! What a cute sketch! Love it! Thanks for playing along with the Friends of Speedy TV!